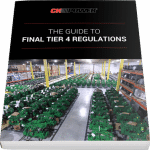 Deciding whether or not your diesel engine is subject to the EPA’s final Tier 4 regulations can be complex. Once you know, implementing these changes has the potential to become a headache. So we’ve put together this guide based on some of the most commonly encountered questions and problems we’ve seen while assisting our customers. How to get around some of the most frequent problems for transition to final Tier 4 compliance.